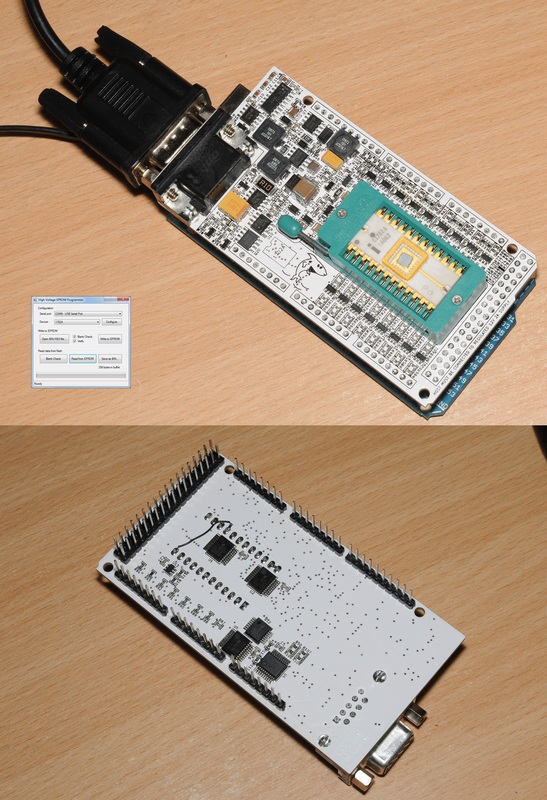 Hi Matthew, Thank you so much for your kind comments and for posting about your new, 1702A programmer project. I will add coverage of it to the survey section as soon as I can complete some much-needed infrastructure work on Tronola.com. Can I have your permission to include the photo and schematic in that? Your project is amazingly compact with the attached Arduino, yet includes on-board generation of all the pesky supply voltages and only requires a serial interface from the PC. That should make it popular indeed! I look forward to adding a link to your upcoming project page when it's available. I hope there will be a way for readers to obtain a board or more. Please keep us posted. Hearty congratulations for your impressive achievement! For the most part it's not based on yours but this page has been my go-to for the last year while I've worked on it. Just successfully read/wrote my first EPROMs with it today. Yes it is running DOS 6.22 natively (from a bootable CDROM. I sent you an email with more details. Thanks for you offer to help. Hi Va3qe, Sorry you have a problem with the project. I'll be happy to help with the debugging. I trust that DOS is running natively on the PC and not under Windows or another OS. You mention that the read LED comes on as soon as power is applied. I take it that you have the computer and the PROMPRG program running when you apply power to the PROM Programmer Hardware (PPHW), is that right? This suggests that there is a logic high on pin-16 of LPT1. Do you see +3V or more there? PROMPRG should be setting that pin LOW initially, so this is something we can troubleshoot. To facilitate that, please contact me at the email address seen after you click the About button near the top of the Home page. We'll get to the bottom of it! I finally got around to building one, but I am having trouble getting it to read or burn EPROMS. I have checked the wiring and I am reasonably sure it's correct. The second LPT port seems to be working. Its setup as BPP. For reading, it always says the results are all 00's. The read LED come on as soon as I apply power. When I try and burn an EPROM, it appears to be doing it, as inner the relay clicking, but I don't see the write LED lit, and when I read the EPROM using another reader, it shows blank. Running DOS 6.22 on an older Pentium machine. Any ideas what to check next? That sounds like an excellent project. I'd be very interested in covering it as an addendum to the article if you're up for that (with full credit of course). The serial interface would be SO much easier for folks to use these days. Feel free to contact me if I can help in any way. My email address is on the about page, accessible with the button on the Home page.